*Sorry this post is a little long... I ramble. Hey all you good people. Lately I've been feeling a little down, partially because the term is ending and finals are coming up; and also because life just hasn't been that interesting lately! Don't get me wrong, because you probably just did. I mean that in a special kind of way. Life is ALWAYS absolutely fascinating, miraculous, exciting, sensational and dynamic - it's amazing! BUT in another kind of way, you also have your own life, in your house, at work and school, etc. See what I'm saying? Life as a whole is forever incredible. But my own specific life, as Emily von Euw in Burnaby... is a little less exciting than the life of the universe as whole. Although, I could even disagree with that and say everyone's own single life is just as intricate, interesting and important... but for the sake of this post, I'll keep it simple. And I don't GET bored! So it makes it that much worse. I feel like nothing exciting or new has happened in awhile. Mentally: I haven't had enough time to think about things (philosophize) as much, so I am not as in tune with myself as I normally am. I don't like this. I always need to be thinking, and it messes me up when I can't! Physically: I've also been too busy to focus on my food and body. Again, this is unusual for me and I am not okay with it. I've been exercising and eating well, that's not the problem. But my mindset has been pretty apathetic about the whole thing; like I don't really care. I suppose you could sum up my attitude and behavior of recent weeks as unmotivated. I think the holidays are definitely going to help with this. That includes the one month break we get as well. YES!!! I'm looking forward to making presents for all my friends and family, decorating, thinking of amazing raw dishes to make for the season, maybe meeting new people? I also need to remember: this is how I work. I go through waves of mindsets. Usually I am a very happy girl, sometimes a little dark/sad, and sometimes just unmotivated! But there's something liberating about writing all this down... even if no one reads it. Ha ha. 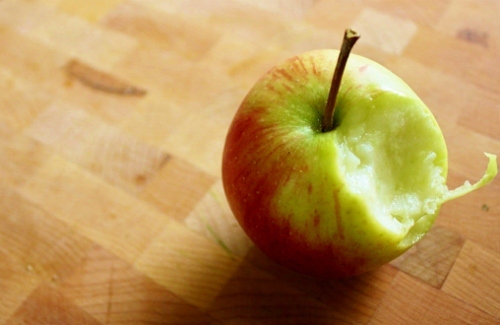 This brings me to the actual TOPIC of this post: my apple cleanse! As said, I want something new and refreshing to mix my lack of excitement up. I've decided to go on an apple cleanse for a few days. Why? After I fast or cleanse I feel renewed, lively, and totally motivated in life. So it's actually the perfect thing for me to do in this case. Plus, we have barrels of local organic apples in our garage, which we pick up via CSA box every two weeks. They are outta-this-world delicious of course, but we can only eat so many! So we've got a bunch extra right now. I think I'll bake an apple pie as well. But right now we don't have Earth Balance and I don't want to work with dairy butter. Don't worry, I'll also make a raw apple pie - they are SO GOOD. All of the above withstanding: an apple cleanse is the perfect solution to my present boredom dilemma. And when I'm finished with it - I'll be on holidays! I think I'll go for about 3 days or longer, depending on how I feel. I'll probably eat around 10 apples per day (or more, or less! ), again it depends on how I feel. For my workouts, I'll mellow them out a LOT, and just do yoga and some trampolining each day. So that's that! We'll see how this goes. This last picture was funny, I wonder if that's what inspired Steve Jobs. They lacked ideas to come up with a name for a company, which eventually was named Apple. I often pay for essay if have problems with the same issue.